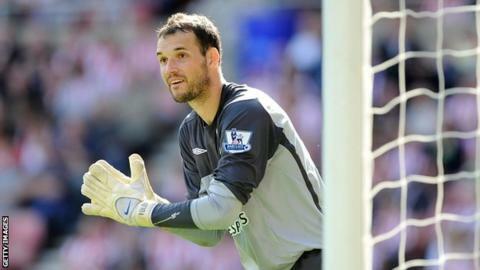 England boss Roy Hodgson said he was "really devastated" by the death of 32-year-old goalkeeper Marton Fulop, who he worked with at West Brom. The former Hungary international, who had had a tumour removed from his arm in 2013, died on Thursday. "When I was told, I was actually quite shocked," Hodgson said. "All I can do is pass on my condolences and say it is a sad day for his family and football." Roy Keane, who signed Fulop twice, said he was "shocked and saddened". On Thursday, Hungary wore black armbands in their Euro 2016 play-off win over Norway to remember Fulop, who was cleared to continue his career after his initial cancer treatment but never played again. The Hungary team wore black armbands in their Euro 2016 play-off win over Norway. He was part of Keane's Championship-winning Sunderland team in 2007 and also worked under the now Republic of Ireland assistant when he was manager at Ipswich Town. Keane added: "I found him to be a great pro and, even more importantly, he was a great lad. My deepest sympathies go to Marton's family and friends." Fulop played 47 times for the Black Cats between 2006 and 2010 and last appeared for Ipswich in 2011, making 38 appearances for the Suffolk club. He also played for Tottenham and West Brom and had loan spells at Chesterfield, Coventry, Leicester, Stoke and Manchester City. Hodgson, who worked with Fulop at West Brom during the 2011-12 season, added: "He was a really, really nice person - a good professional. "I've got to be honest with you, it didn't even occur to me there were any health problems at all." Republic of Ireland international and Stoke goalkeeper Shay Given, who knew Fulop from their time together at Manchester City, added: "When I saw the news, I had to double take - I just couldn't believe it. It's such sad news. "When was at Manchester City I dislocated my shoulder, and he came down [on loan] from Sunderland. He was only there a few weeks but he made an impression on a lot of people. "Everyone from the football family feels for his family and friends."